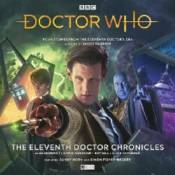 Answering a cry for help, the Doctor and Amy arrive on a misty colony world � but nobody thinks anything is wrong. Nobody, except for one young woman, hiding in shadows and scribbling in her notebook. Dorium Maldovar has a problem. The self-styled �Beacon People� are bad for business, and now they�re in his shuttle park, digging for mysterious minerals. While the Doctor seeks out the source of alien interference in the timelines, Clara recruits some local help � and gets invited to a party. Jacob Dudman (Narrator / The Doctor), Eleanor Crooks (Olivia), Danny Horn (Kazran Sardick), Simon Fisher-Becker (Dorium Maldovar), Nathalie Buscombe (Jane Austen). Other parts played by Jacob Dudman.